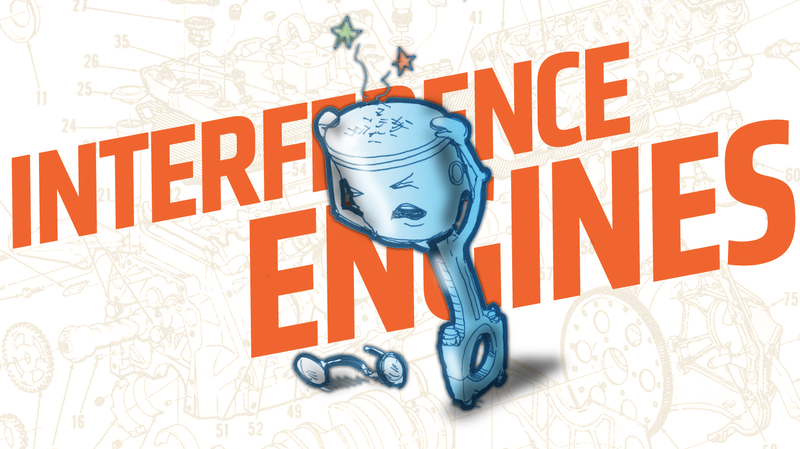 Do you know what an “interference engine” is? While I know a great many of our regular readers do, there’s no shame if you’re not exactly sure. It’s a term that gets thrown around a lot, and is really quite important. In fact, I bet a lot of readers who are familiar with the term are nervously wondering, as we speak, when the last time they changed their timing chain or belt. It’s not hard to understand, so let’s get to it. You may recall last month when we talked about what DOHC means, which led to a discussion about valves, the little golf-tee shaped things that move up and down to open or close intake or exhaust ports in your engine’s cylinders. They basically let the fuel and air either into or out of the cylinders of your engine, where the fuel and air is squeezed by a piston before it’s ignited, powering your car. So, those moving valves are actuated by the camshaft(s), which are driven from the crankshaft by a belt or chain, or multiple belts or chains. These belts or chains are known as timing belts or timing chains, because they drive the cams that control the timing of the opening and closing of the engine’s valves. Got it? So, those, along with the pistons that move up and down in the engine’s cylinders are all the main players in this little drama. Ordinarily, when everything’s running well and life is good, the valves’ opening and closings are timed so that the open valves and the piston are never occupying the same space in a given engine cylinder. When the piston is as high as it can go in the cylinder (a point that’s known as top dead center, because it sounds sort of pirate-like and tough) the valves are closed, because that’s the compression and then power stroke and the cylinder needs to be sealed. It also means that the valves are out of the way of the piston. Now, here’s where we get into what an interference engine is: let’s say that everything is terrible and our timing belt or chain has broken. It broke while the engine was running, so the pistons are in motion. Because the timing chain/belt is broken, the valves aren’t moving, which means some of them are stuck in the open position. If the piston travels far enough in the cylinder to actually hit the open valves, that’s an interference engine. If the piston never gets far enough to reach the valves, that’s a free-running engine. So, if that piston does hit those valves, it’s bad, expensive news. The valves will bend and/or break, the piston itself may take some damage, parts may break off inside the engine block and, generally, all hell breaks loose and you’re looking at a genuinely painful repair bill. In free-running engines, it’s much less of a big deal; if the timing chain or belt breaks, the engine just stops. Nothing runs into anything, and you just need to replace the belt or chain. That’s it! Reading this, you’d think, hell, why would anyone want an interference engine? It just sounds like big trouble waiting to happen, right? What kind of moron would design an engine like that? The answer is many, many morons. There’s a huge number of interference engines out there, and chances are pretty good your car has one. There’s many, many lists you can check to see. So, the question is, why? The main reason why is because everyone wants good engines. That means powerful, efficient engines, and one of the best ways to make powerful, efficient engines is to have engines with high compression. Compression refers to how much the fuel/air mixture in an engine’s cylinders is, you know, compressed. The more you can squeeze that mixture, the more bang you can get for your buck, almost literally. Compressing more, though, means pushing that piston further and further up into that cylinder—which means that piston’s top is very likely to reach the same places where the valves will be when open, which means that the piston and valves have the possibility of—you guessed it—interfering with one another. This is also why nearly all diesel engines are interference engines—by their nature diesels are very high compression engines. The benefits of high compression are so good that many engine designers decide it’s worth the risk to have an interference design. If you’re willing to change the timing belt or chain when the manufacturer suggests (usually starting around 60,000 miles or so, it’s not like changing oil or underpants) then, ideally, you really shouldn’t have to worry. The thinking is you may as well design an engine for the 99.9% of the time when it’s working right instead of focusing on the tiny fraction of time in an engine’s life when it has a broken timing belt, if that happens at all. Overall, this is a pretty reasonable trade-off, but it does require some diligence on the owner’s part. Change your timing belts or chains when they tell you. It’s a big job, but not as big a job as an engine full of smashed valves. This also means if you buy an older used car with an interference engine, and you don’t know when the timing belt was last changed, change it. It’s worth it.